Opportunities to experience vertical tastings are few and far between nowadays. Unless you’re able to visit the distillery and upgrade the tour to include the core range it’s really down to yourself to acquire bottles/samples or arrange your own tasting with friends. In this case my Glengoyne stash has been steadily growing and now I’m ready for launch. 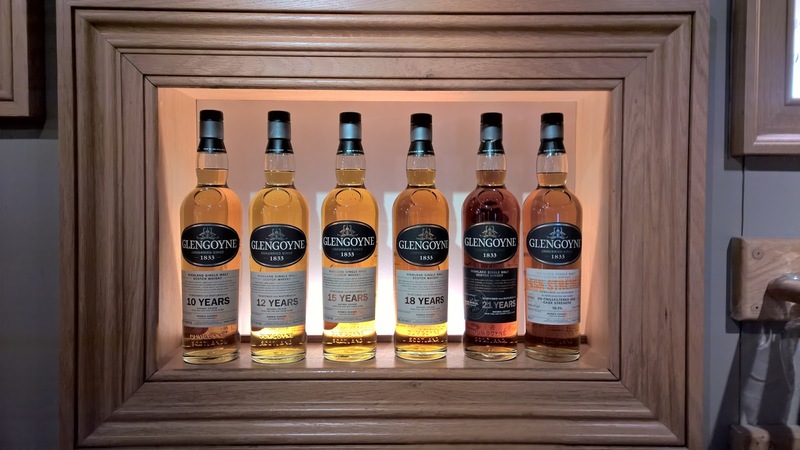 Missing from this vertical tasting is the only No Age Statement whisky Glengoyne currently produce, which is the cask strength release and generally this is one of the better examples of the NAS dynamic. I’ve recently reviewed this whisky in my coverage of their new Number 1 Warehouse tour along with the 2 casks you can bottle from right here. After this piece the only drams missing in action are above the age of 21, the 12 year and the Tea Pot dram – I’ve had this sherry monster before and it packs a punch! Perhaps that’s another piece for another day especially as I continue to eye-up the 5 hour Masterclass tour. For now we’ll start with the Glengoyne 10 year old; a general rule is the ratio of sherry to bourbon casks grows as you go through the age statements before the 21 year old is 100% sherry casks. Nose: very floral with perfume touches, sunflower oil, honey and custard creams. Taste: oranges, vanilla and more honey. There's an ashy backdrop when the wood shines through that I wasn't expecting particularly as Glengoyne avoids peat and smoke so I can only presume the cask charring is responsible; an expected treat. Conclusion: a very faint nose that is inoffensive and a little dull. Fortunately the palate comes to life with a couple drops of water and being sat aside for a while. I wasn't expecting to be that impressed with the 10 year old but with some tinkering its a good standard. Nose: sweetness with orange peel and lemons and then an oily quality best summarised as batter rounded off with crackers and toffee. Taste: a dry oaky malt with a hint of sherry influence but little else. The spicy element comes from the wood with cinnamon, pepper, cardamon and vanilla here somewhat. Conclusion: upon opening I immediately smelled a sherry influence but rather disappointing even after trying to coax some character out of it. Disappointing and not one I can recommend. Nose: an oaty presence mixed with raisins and plenty of spices with mace, cardamon, nutmeg and black pepper. From the wood there is vanilla adding a creaminess and hazelnuts. Taste: lovely sherry notes here a real step up from the disappointing 15 year old. Caramel flapjacks, marizpan and more of those spices once again. A musty feel with earthy tones, rubber bands and cranberries that carries into the lovely finish. Conclusion: you know I was enjoying this one so much I almost forgot to write down my tasting notes and that doesn't happen very often. A really good example of an 18 year old sherry whisky that ticks all the boxes. Nose: marmalade, wood sap, figs, strawberries and foilage. With water more creaminess (once again) and sweetness rises up out of the wood. Vanilla, creme brulee and a little sulphur with added plump red fruits round off the aromas. Taste: full blown sherry as its made up from 100% sherry casks but not the full sized, rampaging beast I envisaged. It's lacking the refinement and authority of the 18 year old. The complexity is also missing; sure some red berries, spices such as ginger, pepper and nutmeg yet that vital binding ingredient and therefore chemistry is awol. 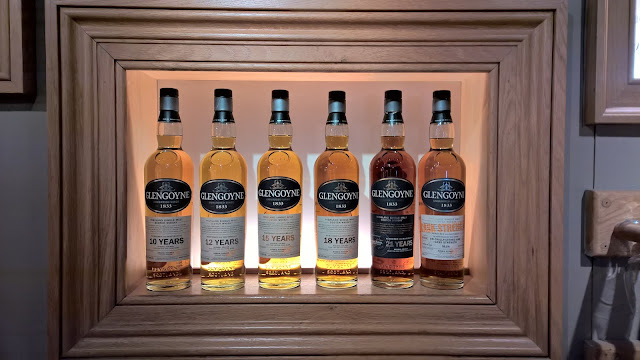 Overall conclusion: well, these vertical tastings always throw up some interesting results in my experience and this Glengoyne trip is no different. It is so easy to go with a whisky based on age alone and the price tag. Given the above selection I'd reach for the 18 year everytime. It's the more refined, lavish and layered experience. After that it has to be the 10 year old which is a real surprise! A little light for Glengoyne sherry fans certainly, but I enjoyed its playful characteristics once I nailed the approach. In hindsight on the linked Warehouse tour piece I plumped for the 100% bourbon cask as part of that tour and I'm thankful I did. The standard of sherry whiskies is high nowadays and to reach those memorable levels is a real ask. The 21 year old falls short of my benchmark but I'm in the minority with this viewpoint. Bottled at 43% seems a little off the mark as well.